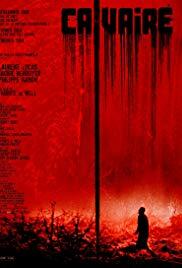 Calvaire is a very unusual movie that does everything to confuse his audience! The scenario seems simple during the first half-hour, but exactly when you think that it is another “countryside maniac movie”, the story unfolds and strange twists reveal a really surprising aspect of the scenario. This very efficiently immerses the spectator into the very bizarre atmosphere of the movie. Some scenes are accelerated or slowed down to further add to the confusion. The scene where they dance in the bar is totally surreal and delightfully caught me off guard (see it here)! I All the characters are totally crazy, and the desperation of the main victim is very well transcribed to the audience. I always secretly wish that the villains win but in this movie it is almost impossible to have anything other than disgust for them. The villagers are simply so twisted and creepy that, for once, you really look forward for the victim to escape! Another gem from the disturbing French horror movie scene (alongside Martyrs, High Tension, Inside, Frontiers, and more).